The STM water doser-mixers Domix 60&70 are equipped with an automatic mixing system, allowing a permanent control of the water temperature. They can have a different number of water inlet and two or one mixer outlets. The automatic mixing system ensures that the set temperature is reached in few seconds, even in the worst conditions. 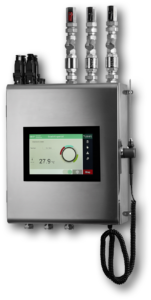 The Dominix 60 models automatically control the process of dosing, mixing and discarding the water not in temperature. Maximum precision is provided, with error margins lower than ±1% on the dosing and ±0.5°C on the temperature. The 10” colour touch-screen shows room, flour or dough temperature. Several communication options are available for remote command: start/stop remote commands; an output for the “end of dosing” signal; RS-485 serial interface with MODBus protocol; Ethernet and USB ports or a complete user interface.